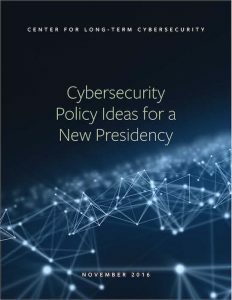 A new report, “Cybersecurity Policy Ideas for a New Presidency,” published by the UC Berkeley Center for Long-Term Cybersecurity (CLTC), aims to help the Trump Administration prepare to tackle the complex challenge of cybersecurity. Authored by CLTC’s Steve Weber, Faculty Director, and Betsy Cooper, Executive Director, the report outlines recommendations for a cybersecurity agenda for the first 10, 100, and 1000 days of the next administration. The report was a centerpiece for discussion at a panel held on November 18 at the Bipartisan Policy Center, as Weber and Cooper were joined by Rep. Will Hurd (R-TX); and Jamie Gorelick, Former Deputy Attorney General and Partner for WilmerHale. The event was moderated by Erin Kelly, Congressional Reporter for USA Today. This panelists discussed challenges and opportunities facing the new administration as it works to prevent, respond to, and recover from increasingly prevalent cyber risks and vulnerabilities. (Video of the event will be posted soon; follow the conversation on Twitter at @BPC_Bipartisan #BPCLive). A New Declarative Deterrence: Establish new norms in nation-state cybersecurity behavior. The new President has a distinct opportunity to set the terms on which norms of restraint should operate, as well as some notional boundaries to serve the long-term interests of the United States. Action is essential to achieve this goal. Grow The Base: Cybersecurity should become the next great public safety measure. Following on from similar campaigns with bipartisan support (think seat belts and anti-smoking), the new administration should launch a public education campaign to prepare current and future generations for a world in which the internet is fully woven into the fabric of every American life. Forgive Loans and Open New Channels: Our universities aren’t creating the number of top cybersecurity professionals needed by our government and companies. We should forgive (or at least defer) student loans for cybersecurity professionals. And we should open new channels—special cybersecurity visas for the foreign born, and online education for everyone—to make entering this field more viable no matter where you live. Establish a Cyber Workforce Incubator: Cybersecurity is a unique space where our job creation and national security needs are aligned. The next President could improve cybersecurity knowledge flow and circulation by creating a new, nimble cyber incubator, allowing the West Coast’s best technologists to work on national security challenges without giving up their work cultures and networks. Create a Cyber Advanced Research Projects Agency (CARPA): This new agency could aggregate existing government and DARPA cyber initiatives and focus specifically on innovating in a field that is increasingly critical to civilian as well as military life. We need government, the private sector, and researchers all working together in this space. A significant institutional move will be required to signal and support a much higher level of attention, investment, and collaboration.